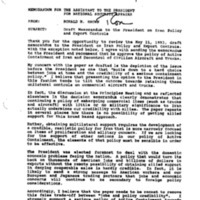 This Mandatory Declassification Review contains material on United States relations with Iran. Materials include memoranda from Secretary of Commerce Ron Brown and member of the Joint Chiefs of Staff Vice Admiral R.C. Macke regarding export controls.